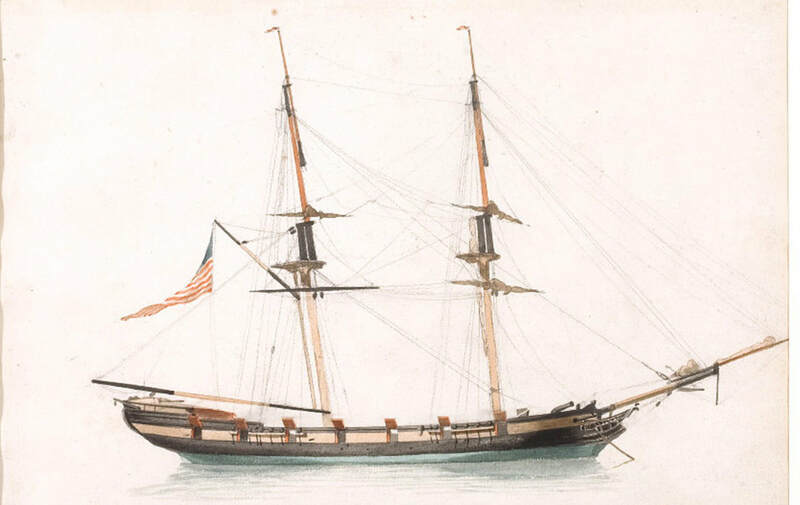 The Louisa was an American merchant ship that gained fame in 1800 while sailing as a privateer out of Philadelphia, Pennsylvanian during the Quasi-War of USA with France. The owners of the Louisa obtained a letter of marque that authorized her captain to act against French merchant shipping during the war. She was armed with twelve 6-pounder guns and manned by a crew of thirty men (including officers). In August 1800 several French privateers that sailed out of Algeciras, in southern Spain, attacked her off Gibraltar. Her captain, Thomas Hoggard (or Thomas Haggard), was wounded and taken below to his cabin. However, Louisa fought off the attack, and Hoggard was taken ashore at Gibraltar, where he subsequently died. The USS Haggard (DD-555) was named in honor of the bravery of Louisa's captain and crew in the action off Gibraltar. 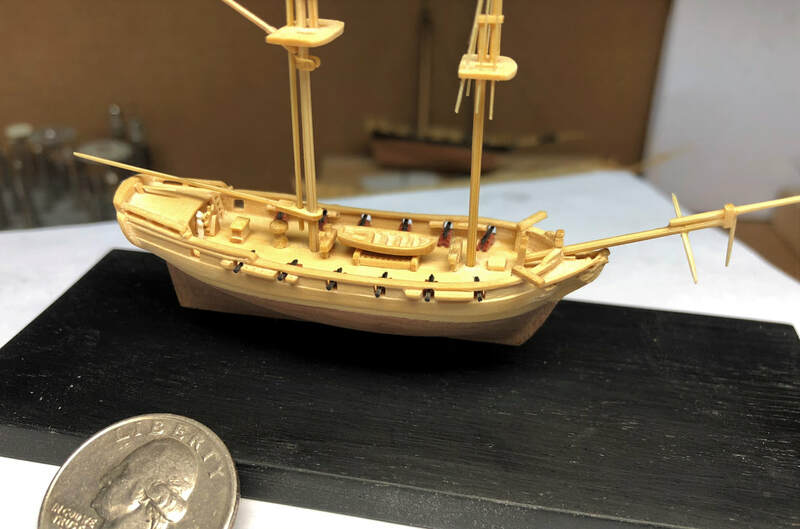 I am building 3 identical models (check this page periodically for progress in photos). Models are made from carefully selected hardwoods (boxwood, ebony, pink ivory etc). 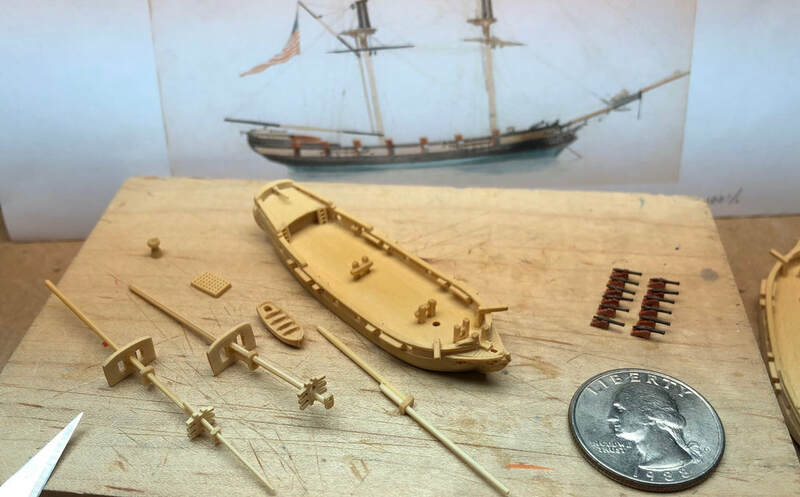 Tiny sailor holding tiller will be carved from ivory ( he is the size of the president’s nose on the quarter!). The hull is only 3.5" long between perpendiculars. 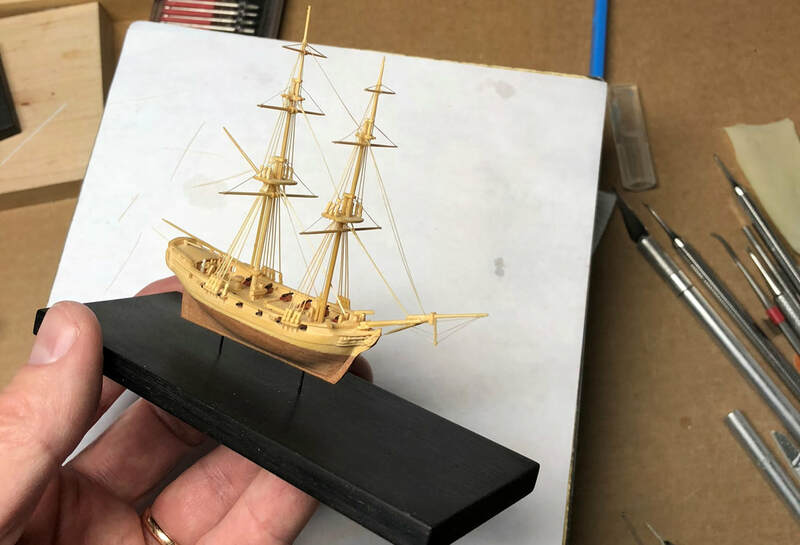 Architectural lines and details of the ship are expertly reproduced in extremely miniature size comparable to smallest known Prisoner-of-War models or Dieppe Ivory sailing ship carvings. 3 models are under construction. 2 available for pre-orders.